Safina Rahman is the Chairman of Lakhsma Sweaters. She is one of the sailors of this company who has embedded a culture that People Comes First. She is very gratified of the fact that in recent years Lakhsma has the significant retention rate in the history of Lakhsma. Safina says “We believe in being transparent with our clients & with our people. When they understand what we are doing – including our challenges – partnership is stronger”. Safina is responsible for guiding and managing all operations, finance & administrative activities. Demonstrating great leadership skills and driving high performing teams, she has been successfully executing strategies and contributing to the overall success of the company. She is concern of continuous development of Capacity Planning & Work Measurement so that all of her workers can reach at top of their efficiency. Though profit is the concern but Safina’s main concern is the compliance. Apart from being a business personality Safina is highly associated with philanthropic activities. Lakhsma participates in CSR activities by her direction. Safina believes business is for the development for society. Currently she is the District Governor of Rotary and she is tied with many other voluntary associations. Aamani Shahper is the daughter of Sabina Rahman and the fresh blood of Lakhsma Sweater. She studied design in United States and now Aamani is working for Customer Need Analysis & Future Requirement Analysis. Aamani has the visionary eye for fashion and designing. Her promissory objective is to address the future trends so that Lakhsma can offer the best design to its customers. 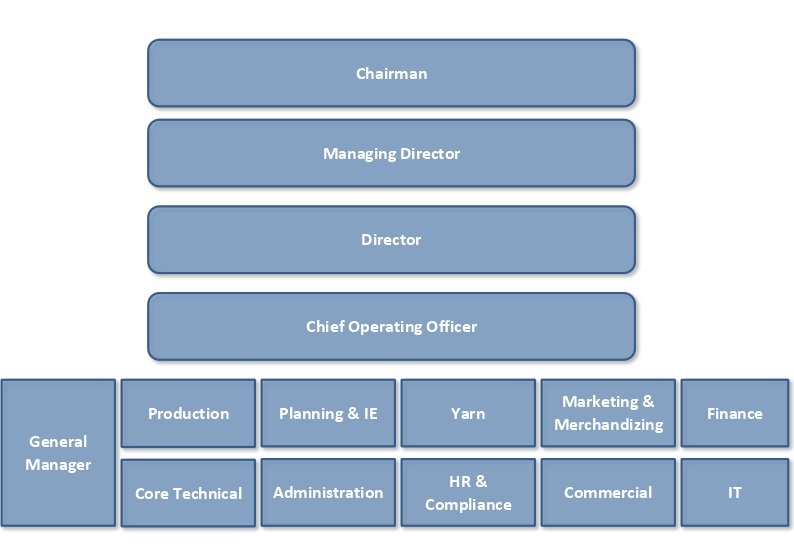 Below structure broadly illustrates the hierarchy layout and operational responsibilities of the Board and the Leadership teams of Lakshma Sweaters Ltd.